The perfect 5 minute breakfast to make the one you love! 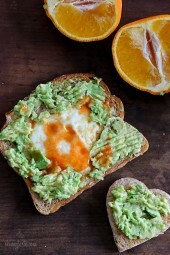 Whole grain toast with mashed avocado, eggs over easy and a few dashes of hot sauce – 5 ingredients, 5 minutes to make, doesn’t get better than that! I’m obsessed with avocado toast and eggs lately as you might have noticed! I was thinking about Valentine’s Day breakfast ideas and forgot I had these heart shaped cutters, so immediately this came to mind. I bought heart shaped cutters on Amazon last year, but even if you don’t have fancy cutters, you can keep it simple and use the rim of a glass to cut out a hole. With a heart shaped cutter or the rim of a glass, press a hole in the center of the slice of bread. Mash the avocado with a fork and season with salt and pepper. Heat a skillet over medium-low heat and spray with the oil. Place the bread and the cut out piece on the skillet and crack the egg straight into the center of the hole. Cook until the egg sets on the bottom, about 1 minute, season with salt and pepper and flip over with a spatula, season with salt and pepper the other side. Cook the other side until the yolk is to your liking, I prefer mine soft. Remove and top with avocado and hot sauce if desired. Yummy, can’t wait! Question about the points, Gina – my WW app says that ½ a small avocado is 4 Freestyle points, and toast is 2, making this a 6 point meal (not 4 as you have listed). 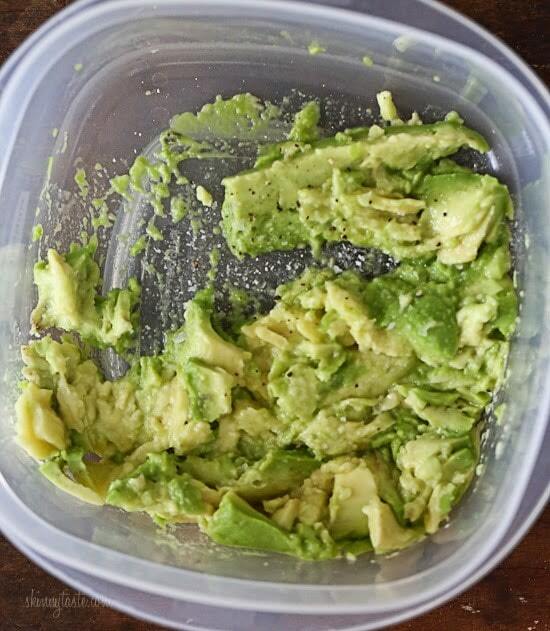 In the ingredients you list 1oz avocado, but isn’t ½ an avocado more than 1oz? What am I missing? It says to use 1 oz. Which is 1 SP. This was amazing! So quick and yummy! Campfire favorite. Add 1 tbsp of salsa to the avocado mash. To make this heart-healthy, I used egg whites instead of a whole egg! Deelish! Can anyone tell me how to put together a meal plan? I am struggling with what goes with what. This is a great breakfast. Slice some nice ripe tomatoes and a couple of green onions (scallions is what some call them) maybe a little cucumber to eat along with it and you have a wonderful lunch also…We like to have Breakfast for supper also occasionally. Does the bread count in the calories? Absolutely adorable! 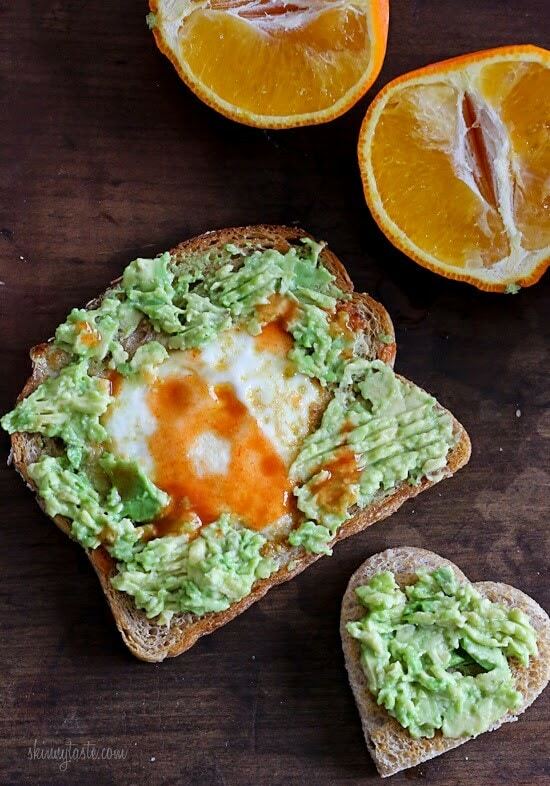 It doesn't get much better than avocado and eggs! I just bought a bunch of avocados for the kids, but I think I need to keep some for myself to try these avocado toast recipes! Yum! This looks absolutely delicious! I am just now starting to enjoy avocado more! Can't wait to give it a try! We love these savory flavors! 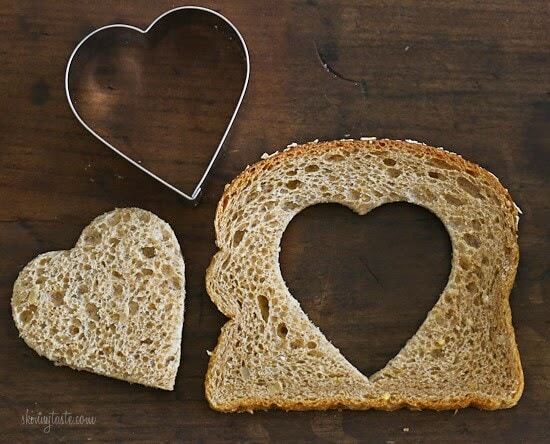 Clever idea to use the cookie cutters on bread during Valentine's week :). 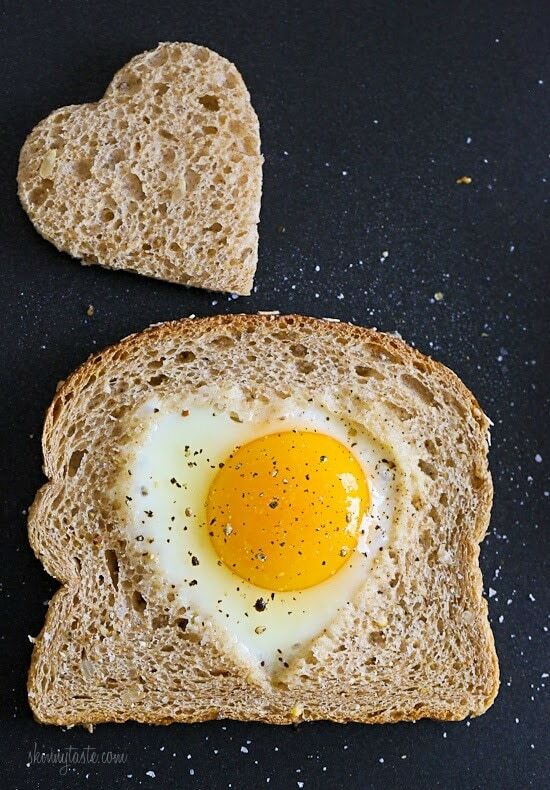 Egg in a heart hole. Looks delicious! yummy! That little heart cut out is so cute! 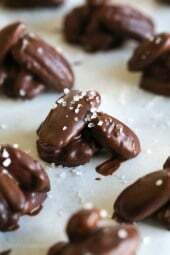 I like seeing valentines day food that isn't all chocolate and desserts all the time. This is our first year with chickens (and the farm) and I am trying to figure out different things to cook with the copious amount of eggs. This looks great. All of us(except my youngest) love avocado. Forgive me, but I will never buy any product from China that comes in contact with food that goes in my body. 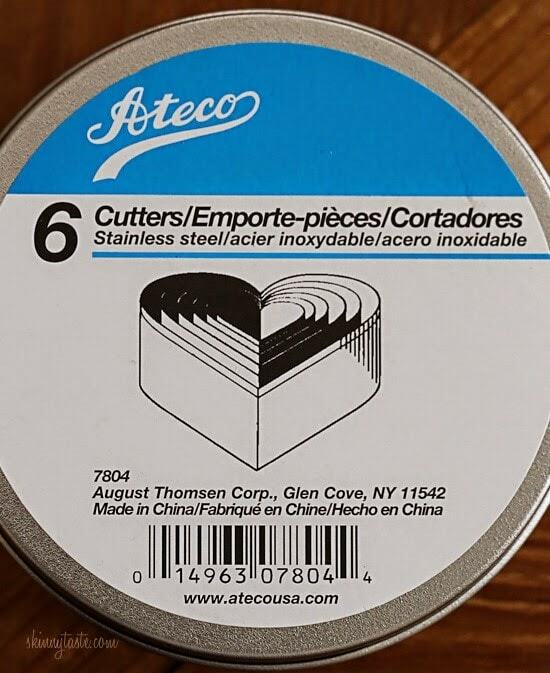 Like the recipe, but I'll use a cookie cutter that's made in the USA. Really, that’s what you got from this recipe? Great recipe Gina… thanks for sharing!! Yum! I make a breakfast sandwich like this almost every day. Love the heart cut out idea for Valentines! Hi Gina: I am enjoying your book BTW. But since I got the recipe for Avocado Toast with Sunny Side Egg I have been having one for breakfast almost every day. I just love how simple and delicious it is. What I have learned is to be successful with managing your weight is to find something you love to eat and it won't feel like a D-I-E-T. Thanks for your efforts to help all of us. 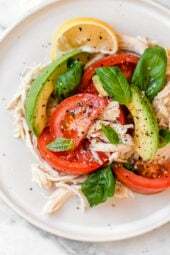 Just had this over the weekend as a pre-run meal….great, balanced meal – carbs, healthy fats and protein! Yum! OH MY GOSH! How genius is this! I make avocado egg toast like it's my JOB (and sometimes it is!) but I always use a soft boiled egg on top. Love the fried right inside!! Pinned! This looks so amazing. I love avocado toast. 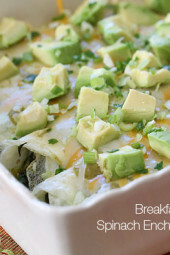 This would be great for breakfast, lunch or dinner. Yes, this is awesome! This is combining all the things needed for a perfect breakfast – fried egg and avocado toast. I love egg in the holes. I've never thought to use cookie cutters to make different shapes. What a great idea! I've always called it "bird in a nest"!